Blackjack Cars have been producing 3-wheelers since 1995. 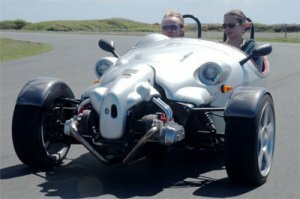 Based in Cornwall (UK) and founded by car designer Richard Oakes, his first 3-wheeler was the Blackjack Avion and was offered as both a whole vehicle or in a kit form. Using pre-war racing Morgans as inspiration; the Avion was an open two seater vehicle that was based on the Citroën powertrain and front suspension with vertically mounted dampers. The rear suspension had a swinging arm with a spring and damper unit. The body was mad from a polyester body moulding with subframes ad had a moulded windscreen. Around 15 vehicles a year are believed to have been sold. 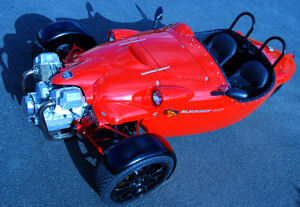 The Blackjack Zero was first designed as a prototype in 2004 and in March 2005 became the first kit car to pass the SVA test first time through. As with the Avion, the Zero was designed by Richard Oakes. 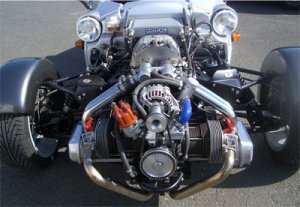 Available in kit form the Zero is powered by a Type 1 VW 1600c engine with big valve heads fitted with a large volume oil pump and the crankcase drilled and tapped for an external oil filter. This along with a few other tuning recommendations is added to a VW gearbox originally fitted in the 1302S Beetle (1970 – 1972.). Keeping to the VW theme. the brakes and front suspension are modified from a VW Golf GTi. The body has a steel chassis whilst the main body tub with reinforced bulkheads and panels are made from fibreglass helping to keep the weight of the vehicle down to 450kg. In 2008 a new derivation if the Blackjack Zero was introduced using the Moto Guzzi 1100 V Twin engine. As with past models the 2008 version is front wheel drive.